Looking for a last minute holiday or short break? Visit our sister site lastminutelodges.com for some great deals. Prefer not to use a booking agent? You can book direct with some of our lodge owners. Find them at the top of every search result listing. Bring your dog on holiday too! For the kids - and big kids too! Who wouldn't want to wake up to this view? Romantic breaks at Weybread Lakes. The fishing is good too! Click here for pet friendly lodges. Welcome to Just Lodge Holidays and possibly the largest online collection of self catering holiday lodges and log cabins to rent. From small budget lodges to large and very definitely luxurious lodges, we are sure you will find one for your dream lodge holiday. Luxury self catering lodge with Deluxe hot tub overlooking a beautiful fishing lake. designed with families in mind, this lodge offers free wifi, games console, fully equipped kitchen & gorgeous interiors. Check out virtual tours & video tours on our website as well as a wealth of information on the accommodation, the holiday park & the surrounding area. Durley Lodge is one of only two lodges set in a stunning location overlooking a private fishing lake in a beautiful valley. Our lodges offer peace, quiet and privacy and yet we are only 10 minutes from Junction 27 of the M5 and so are central for exploring all areas of Devon. Each of the spacious lodges has a double bedroom with ensuite shower room and a twin bedded room. The family bathroom has a bath with overhead shower. The main room is open plan with kitchen, dining and lounge areas. Outside there is a large decking area with glass fronted balustrades, sun loungers, BBQ and your own private hot tub. Complimentary bottle of wine, flowers and chocolates for every booking. For more information, prices and availability, please click on 'website' above. Lodge with Hot Tub and decking, part of Shorefield Holiday's Signature range. Two bedroom lodges with decking and offering stunning views of the coast and Purbeck Hills. Sleeping up to 6 people as there is also a double sofa bed in the lounge. Some pet free and some pet friendly; fully equipped kitchen. TV/DVD and full heating. For more information and images, please click on the 'Check Availability' or 'Website' buttons. Five star lodge with special edition hot tub. Perfect for couples seeking a romantic break. Torduff Lodge is really special! Torduff sleeps four people and has one king size bedroom with en-suite bathroom, and one double bedroom with en-suite shower room. The spacious open-plan living area leads out through the panoramic windows on to the large decking area and veranda which has breathtaking views across open countryside to the Solway Firth and Scottish Mountains. To the rear is an under cover decking area, with secluded hot tub featuring a volcano jet, and music system, enabling you to chill out while you play your own music via your iphone. All guests at Limestone Lodges have free access to the Spa at Armathwaite Hall. For more information, prices and images, click on the 'Check Availability' or 'Website' button above. LABURNUM LODGE, SITUATED WITHIN THE IDYLLIC COUNTRY GROUNDS OF GOOSEWOOD PARK, WE AIM TO OFFER THE ULTIMATE EXPERIENCE IN LUXURY CABIN HOLIDAYS. IT IS IN A PRIME LOCATION RIGHT AT THE SIDE OF THE FISHING LAKE. LABURNUM IS A SELF CATERING 2 BEDROOMED LODGE THAT SLEEPS 4 - 6 PEOPLE AND IS FULLY EQUIPPED TO GUARANTEE YOU HAVE EVERYTHING YOU NEED FOR A ENJOYABLE STAY. WE ALSO HAVE A SOFA WHICH TURNS INTO A DOUBLE BED. THIS STUNNING LODGE HAS A BRAND NEW PRIVATE HOT TUB SITUATED ON THE DECKING AREA. WE ALSO HAVE OUTDOOR SEATING AND BBQ. WITH SWIMMING POOL, BAR/BISTRO, CHILDRENS PLAY AREA, AND SHOP ONSITE YOU REALLY WILL BE SHORT OF NOTHING. ALL YOU NEED TO DO IS RELAX AND ENJOY YOUR HOLIDAY. Luxury 5 star Gold Award Lodge with hot tub overlooking our lakes surrounded by woodland. Stretton lakes is situated within 120 acres of farmland. Silver award winners at the National Enjoy England Excellence Awards for self catering holiday of the year 2011. Gold Award for self catering in the East Midlands. This lodge is a one bedroom 5 star waterside luxury log cabin for couples only and has an extensive decking area, canterleving out over the water for unspoilt views. Step down off the decking to your very own private jetty for either fishing or just watching the carp swim by. Not only does this lodge have its own private outdoor heated hot tub, but also offers a sauna indoors. A large spacious lodge, finished to an exceptionally high standard with oak furniture and leather corner sofa, flat screen TV in the lounge and bedroom. Hifi with iPod docking station plays music to every room in the lodge including the sauna. This unique bespoke lodge has round log interior to give a real alpine feel, underfloor heating throughout, ensures the cosy feel whatever the time of year. Jules lodge is one of the two luxury lodges at Brompton Lakes that is not directly on the lakeside as this lodge has an exclusive log burning hot tub in the garden, which can be used all year round. Prices include the hot tub. Jules sleeps up to six people and the master bedroom has luxury en suite facilities. There is a spacious open plan living area with full height glass sliding doors leading to the large private decking area. This is the perfect outdoor space for al fresco dining with a charcoal BBQ and outdoor seating area to enjoy. The lodge’s elevated position commands an impressive view of the East lake. The lodge has a modern kitchen which is well equipped with everything you should need and more on a self catering Yorkshire holiday alongside the spacious living area with a cosy log burning stove and comfy stylish sofas. There is free Wi-Fi throughout the lodge. Jules is a dog free lodge. Outside Jules there is ample parking next to the lodge with good wheelchair access. Z-beds for children under the age of 10 for an additional cost of £25 each. For more information, prices and images, please click on the 'Check Availability' or 'Website' buttons above. If a break without your mobile phone, television or internet signal sounds like bliss, then this is the log cabin for you. Purposely built to be as rustic as possible. There is a wood fired hot tub and a barbecue and a bathroom pod behind the log cabin with a hot shower, toilet and sink. Pine lodges with hot tubs sleeping from 4-8 situated on a 4 star Park, near the forest yet only 9 miles from sandy beaches. Fully equipped kitchen, decking area outside with seating and hot tub. Located on the Four star rated Oakdene Forest Park, which borders the Avon Forest and unspoilt river meadows. Due to the numerous lovely walks and cycle trails leading straight from the park into the forest, you can quickly reach nature reserves, country parks, local attractions and Forestry Commission land. Oakdene Forest Park is an ideal park for families, especially those with young children, with great on-park facilities including the Go Active plus programme - more than 20 sporting activities for all ages. These luxury Select and Superior pine lodges sleep from 2-8 situated on a 5 star country park, near the coast and close to the New Forest with indoor & outdoor pools, extensive leisure facilities and club with entertainment. The Superior lodges have a hot tub - please specify when booking. Forest Edge is a small 9 acre park close to the New Forest and a short drive to Bournemouth and Poole, both very popular seaside resort towns. Onsite there is a children’s play area to enjoy and all guests are issued complimentary passes to use the club and leisure facilities at Oakdene Forest which is just 1 mile away, complete with pool, bars and more. Also within a20 mile range are Peppa Pig World, Go Ape and Paultons Park to enjoy. High in the Lakeland Fells on a working hill farm, High Borran Lodge is one of three lodges, beautifully situated and luxuriously appointed to provide the perfect self-catering get-away for couples seeking peace and quiet amid stunning Lake District scenery. High Borrans is a tiny settlement well off the beaten track in the fells between Troutbeck and Kentmere, very close to Windermere and the cosy timber lodges provide the perfect holiday accommodation for nature lovers and those romantic breaks away from it all. In a quiet rural location, High Borrans Lodge is only a very short drive from the main access road into the Lake District (A591). Windermere, with all its restaurants, shops and other amenities, is barely 10 minutes’ drive away and the M6 motorway can be easily reached within 20 minutes. High Borrans Lodge is a Nordic-style timber lodge built to the highest specification to provide tasteful and romantic self-catering accommodation for couples, with all the conveniences that today’s discerning holidaymakers are seeking. Incorporating the highest levels of insulation and super-efficient heating and lighting, the lodges are totally energy-efficient, and emissions are minimal.The bright and airy design and clean lines are complemented by high-quality wool-mix carpets and luxurious soft furnishings in warm country tones. York Holiday Lodges operate two luxury lakeside lodges with deluxe hot tubs at the popular Goosewood Holiday Park just 6 miles from York City Centre. We pride ourselves in providing superior family breaks & include many extras in our accommodation which meets the needs of our guests. Wifi for as many devices as you need to connect & top on demand televesion entertainment packages. A fully equipped modern kitchens, beautiful interiors & ultra high spec hot tubs overlooking the fishing lake. One of a small group of five traditional log cabins with hot tubs, located on the edge of the River Lyne. All with beautiful views and all very dog friendly at no extra charge. We are also a wedding venue with a difference. Book now for the Summer and swim in your own private river along with the fish! New two and three bedroom, 2 bathroom lodges in idyllic woodland setting with hot tub on the decking area. Located on an exclusive lodge development at Merley Court in a pleasant, peaceful woodland setting. Sleeping four to six, the bedrooms can be configured as doubles or twins, one with en-suite. A fabulous kitchen with both dishwasher and washing machine and a spacious lounge, which leads out to the large veranda and hot tub. Adult bikes and helmets are also provided – perfect for exploring the Castleman Trailway which starts just metres from the lodges. Beds are made up for arrival. One of the lodges is pet friendly. Stunning with far reaching sea views from the terrace, this modern and spacious New Hampshire Lodge is 42ft x 16ft provides luxurious accommodation, complete with large veranda , full size bath, en-suite shower to master bedroom, large twin room and private driveway on a quiet no through road and yet only a short walk to the facilities on site. FREE COMPLETE LINEN SERVICE: When you book this New Hampshire Lodge for 7 nights or more ALL necessary beds will be made and a bath and hand towel will be supplied for each guest ready for your arrival. LOUNGE; The emphasis is on relaxation and comfort in spacious accommodation, quality features throughout. From the beautifully designed and furnished lounge including 42" TV and DVD, you can enjoy the outstanding panoramic sea views available from inside or out on the veranda accessible from the French doors. KITCHEN & DINING AREA; The Hampshire’s modern kitchen combines style and functionality. The kitchen benefits from a 5 ring gas hob, double oven and grill, extractor fan, integrated microwave and ample storage. The kitchen also benefits from a full size integrated fridge freezer. The dining area benefits from free standing dining table and high back upholstered chairs. The washing machine is located in the boiler cupboard. BEDROOMS: Bedroom one has a generously size double bed, bedside tables with lamps, spacious wardrobe and full en-suite bathroom complete with shower, toilet and wash basin. Bedroom two is extremely spacious and comes complete with 2 single beds, bedside cabinets, TV, mirrored wardrobe and tall chest of drawers. There is room for a travel cot in this room. BATHROOM & TOILET; The New Hampshire Lodge has the great advantage of two bathrooms. The first with full size bath and over- head shower, toilet and wash basin. The master bedroom as previously mentioned provides a full en-suite complete with shower, toilet and wash basin. HEATING; KW2 has double-glazing and a gas combi boiler, central heating system with radiators in all rooms, this means you can holiday all season in comfort. VERANDA; YES large front and side glass panelled veranda, accessible from front and side French doors and benefiting from lovely views across the park and out to sea. The veranda as do ALL the verandas with Newmans comes complete with patio furniture. PRIVATE DRIVE; Yes, parking is adjacent to the lodge. If you intend to spoil yourself at Devon Cliffs with levels of comfort throughout your accommodation and wish to look forward to relaxing on the veranda whilst enjoying the superb views then this is most definitely the choice for you. DISTANCE TO MAIN AMENITIES; approx 8 minutes walk. There is a full gym plus shared hot tub on site with loads of other things to do plus restaurants cafe bars entertainment plus indoor and outside pool and a private beach. Comfortable pine lodge with its own fishing peg, located on the Duck Lake, a quiet peaceful area of Tattershall Lakes Country Park. A great place to relax. Also on the park, golf course, 4 fishing lakes, watersports, children's play area, clubhouse with bars and cafe. Shelduck Lodge is a traditional pine cabin with its own fishing peg on the Duck Lake at Tattershall Lakes Country Park. The lodge has 2 good sized bedrooms, one double and one twin, and a sofa bed in the lounge, a family bathroom with shower over the bath, an open plan living area with comfortable sofas, a flat screen tv with freeview, dining area and fitted kitchen with dishwasher. Outside the raised verandah has been extended to accommodate a family sized table and chairs for al fresco dining and has ramped access suitable for wheelchairs. There is car parking for two cars. The fishing peg, just a few yards from the lodge has been made extra wide to accommodate a wheel chair with a carer if necessary. Activities on the park include jet skiing, water skiing, wakeboarding, archery, pedalows, walks, cycle paths, kayak safaris and a children's adventure playground. Opening the end of May 2011 indoor swimming pool, lake view hot tubs for 8, which will be available for private hire and spa with pop-in pamper treatments and relaxation area. Also on the park a well equipped launderette and convenience store open from Easter until the end of October. Limekiln Lodge is one of only 3 lodges at Limestone Lodges. A small and exclusive development on the fringe of the Lake District National Park. Limekiln has had a very successful couple of years, sleeps just two people with one double bedroom with en-suite bathroom in a lodge which combines the old with the new. Limekiln is just perfect for a romantic break with a private hot tub and superb views. The spacious open-plan living area complete with stylish furniture and leads out through the panoramic windows on to the large decking area and veranda which also has breathtaking views. We are sure that you will find just what you are looking for amongst our huge collection, whether you are looking for a lodge or log cabin holiday, or maybe a short break, in England, Scotland, Wales or Northern Ireland, our Quick Search facility will make it easier for you to find. Sometimes you just want to hideaway in a secluded location to relax and unwind away from the pressures of work, or perhaps take your loved one away on a romantic break. 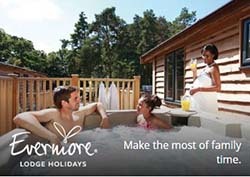 We have some lovely lodges with hot tubs. Those bubbles are just waiting for you to sink into with a glass of bubbly in your hand! Oh, how our surfers love fishing and we have an abundance of fishing lodges and log cabins, whether it is in stocked pools, lakes, rivers or even the sea. What a thrill to go down to the beach and catch your supper! Don't leave the dog behind! If you want to bring your four legged member of the family, then narrow your search by clicking on the Dog Friendly category. If you want to take the children for a good old fashioned bucket and spade seaside holiday, then click on the 'Close to the sea' category. Some of our lodges are within walking distance of the sea, but all will be no further than approximately three miles away. Let's get those toes a-paddling!